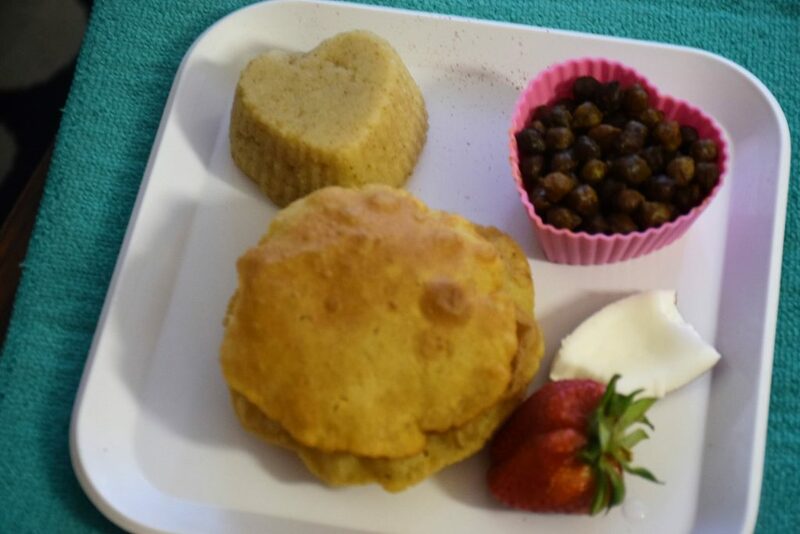 Poori /Puri or Indian puffed whole wheat bread is the most popular item in every household. It is enjoyed with Rasewali, halwa, kheer, matar paneer, shahi paneer, bhindi and so on… 😀 . Yes it could be enjoyed with countless gravies or curries. It is the deep-fried, most delectable bread of all breads ,which could be prepared in advance without any loss in taste. If you have ever been to Hardwar in India, the “Chotiwala restaurant” is famous for this item along with Chhole and its chaat. Not only the beings, we make them to appraise our Gods and Goddesses. Recently, I made them with Kale Chane and Halwa on Durga Ashtami to appease Maa Durga and little kanya(unmarried girls) or kanchak. The whole platter including pooris, kale chane, halwa, fruit,coconut, dakshina (gift) is called “Kanchak Prasad”. 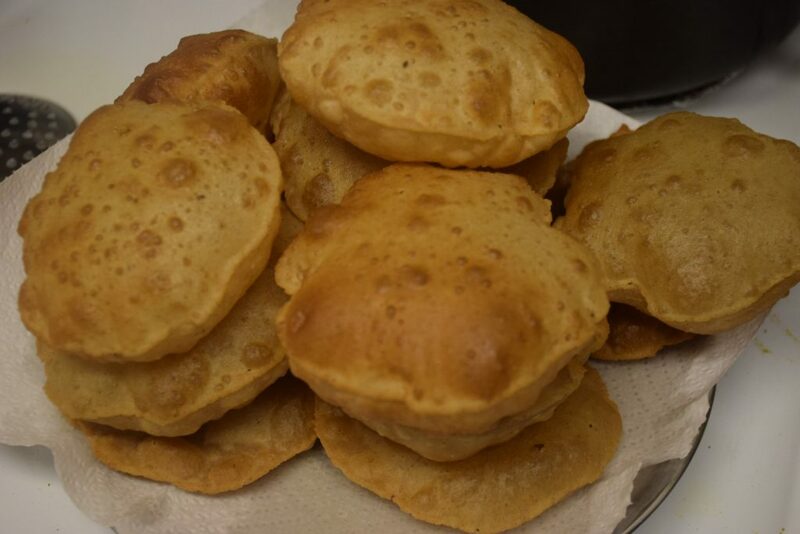 I am sharing the basic recipe of Poori here. But there are many variations which could be done to suit your requirements. For example, knead the dough with milk ,to prolong the shelf-life of these pooris. (Poori made with milk could last upto 4 to 5 days in normal weather, and upto 7 days in cold weather.) Another is to use Sooji(semolina) in 1/4 parts of Atta (whole wheat flour) i.e. 4 parts of Atta with 1 part of sooji; to increase the crispiness of the pooris. 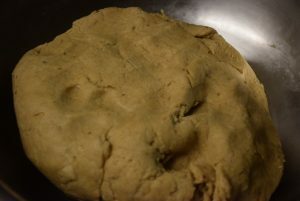 Yet another variation is to knead a dough of Maida (refined flour) which is also called Kachori in some places. 1. Although, there is nothing special about preparing its dough, there are certain points which need to be taken care of while kneading the dough. 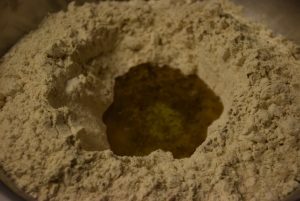 Take a tureen(paraat) or thali (a large platter) , add flour in it and make a well in the center. 2. Now , add oil and carom seeds in the well. You may add salt too , if you usually add. Adding salt and ajwain is not religious or is not related to the crispiness of the poori. But salt+carom seeds make a good digestive aid which helps in digesting this deep-fried poori. 3. 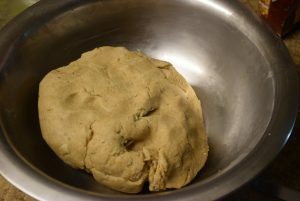 Add water cautiously to the flour to knead a semi-soft smooth dough. The dough should neither be too tight nor too soft. Softer and richer dough could be made with milk to enhance the shelf-life of these pooris. But it is cumbersome to roll out a too soft or too tight dough. 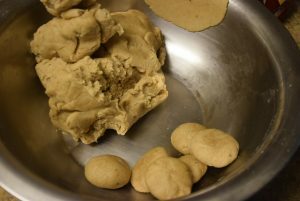 Also if the dough is not kneaded well, the rolled pooris would have chipped edges and cracks in the dough. 4. Knead it well in the tureen or on the kitchen counter to make it smooth and pliable dough. You may keep it covered for 15-20 mins or can start rolling instantly. 5. 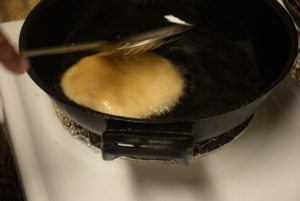 Preheat oil in a wok (kadhai) at medium heat for deep frying the rolled poori. In the meantime, make small roundels from the dough and cover them with a wet towel to prevent drying. 6. Check the heated oil by dropping a pinch of dough in the oil. If it comes up instantly and keep floating, the oil is ready. Roll the pedha(roundel) in a small disc of about 5 -6 cm in diameter. Make sure you rolled it evenly ,without any chipped edges or cracks. 7. 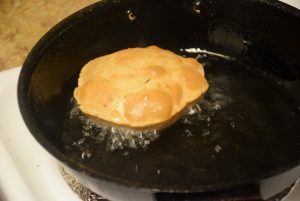 Slid the poori gently from one side in the wok and let it cook and sizzle till it comes up and puff up. 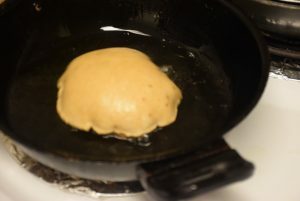 You may turn the oil with your slotted spoon (knocha/poni) to help it puff or you may pour the oil on it through the wok to get a puffed poori. 8. When one side is cooked and browned , turn it to the other side. Wait till one side puffs up, then you may turn it to the other side.Let it float for 4-5 seconds or till you see the other side cooked and then take it out in a paper-lined plate. This way the paper towel will absorb the excess oil of the poori. 9. 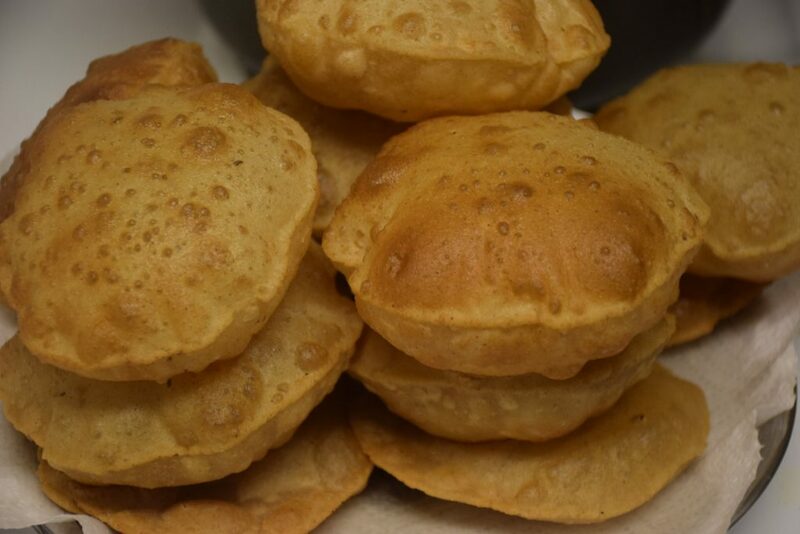 Fry all the pooris similarly and you may stack them one over the other once they are cold to touch in a casserole or a basket lined with paper towel. Serve it hot or cold with your favorite curry like Chhole or Aloo. Enjoy these fluffy discs in any weather !! This entry was posted in Food, Kids- Favourite, Main Course, Recipes and tagged ajwain, atta, Carenshare, carom seeds, deep fried, Extra virgin olive oil, Haridwar special, haryana, kachchi ghani, most popular, mustard oil, North-Indian street snack, Punjab, Rajasthan, refined oil, sarso ka tel, shweta jindal, U.P., Uttarakahnd, whole wheat flour, zindagisikhati.